This summer, I worked in PennDOT's District 1 Press Office, which includes Crawford, Erie, Forest, Mercer, Venango, and Warren counties. It was my second summer working for PennDOT, and I couldn't be more appreciative of the experience. As a communication studies major, PennDOT was not the first organization I thought of when looking for summer employment. In my mind, PennDOT was primarily known for its engineering. What I later came to find is PennDOT houses diverse jobs, and people with an array of talents and specialties, like the Press Office. Through my work with the Press Office, I was fortunate to be surrounded by all the different sides of PennDOT. In addition to gaining professional experience in my field of study, I have been able to learn from the employees themselves about different aspects of the PennDOT process — like the environmental precautions the department takes when preparing for a job, the intricacies of properly installing ADA curb ramps, and how the district conserves funds by pre-casting bridge components. I have also been able to meet other interns while working at PennDOT. Those I talk to agree the internship program offered at PennDOT has been a worthwhile investment and rewarding experience. 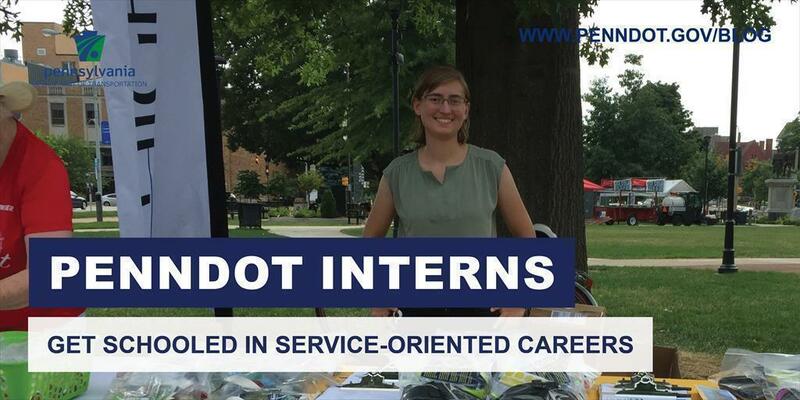 Interns at PennDOT represent all different aspects of the organization, including human resources, construction, IT, design, maintenance, and construction. I even had the pleasure of sharing my experience with my brother this summer. He came to PennDOT as an intern in the Information and Technology unit, which has given him career-specific experience as he is working toward a degree in Computer Science. Gaining real-life skills and hands-on knowledge benefitted myself, my brother, and the other interns as students and future employees. We will go out and represent the quality of experience PennDOT offers in our respective schools and work at our future jobs. We didn't simply have a summer job, we gained three months of career-building experience. Beyond that, time at PennDOT has given me a greater appreciation of service-oriented jobs. The PennDOT employees I've had the honor of working with have been accommodating to student interns and always mindful of their jobs. As a state organization, the employees offer their work as a service and are always looking to aid the people of Pennsylvania to the best of their abilities. I hope to continue this attitude of service even as my internship has ended. Among the most memorable experiences I've had in the past two years have been filming the demolition of an old bridge, seeing and reporting on a superload that was delivered to the Port of Erie, and participating in a television interview to promote bicycle safety. These, among many others, have been fun learning opportunities and have provided me with skills specific to my intended career. As a rising junior applying to PennDOT in 2017, I could have never imagined that two summers later it would have had such a positive impact on not only me but also those around me, like my brother. I am very thankful for the experience that PennDOT has given me and I look forward to using it in my professional career.